Companies are required to conduct the clinical trials for the higher risk medical devices in China. They are divided into clinical trial and clinical verification depending on whether the risk can be controlled. The regulations on medical device and clinical trial in China have been revised and implemented from 1st Jun 2014. It may be involve long time, great effort and resources to develop the clinical trials in China. Which medical device is required to conduct clinical trial in China? 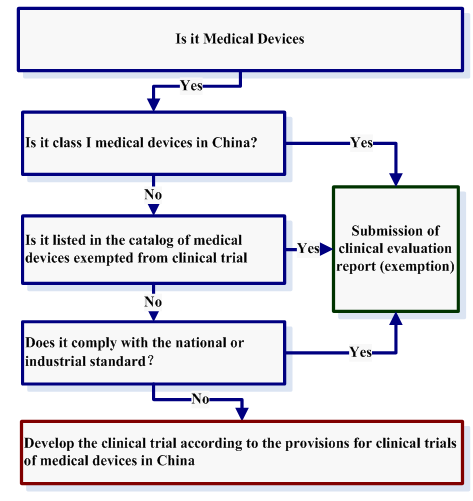 Class II and class III medical devices are required to develop clinical trial in China according to the “Regulations for the Supervision and Administration of Medical Devices”, only the devices designated by CFDA to be exempted from clinical trial are not required to conduct the clinical trial, but the clinical evaluation report should be submitted. The Catalogue of Medical Devices Exempted from Clinical Trial can be found here. How to confirm the clinical trial requirement? Which clinical trial should be approved by CFDA? The clinical trial of higher-risk medical devices should be approved by CFDA before conduct clinical study in China. CFDA will designate the specific medical devices and form the catalogue of class III medical devices required clinical trial approval. Any medical devices listed in the “catalogue of class III medical devices required for clinical trial approval”, companies must apply for its clinical trial approval prior to clinical study. 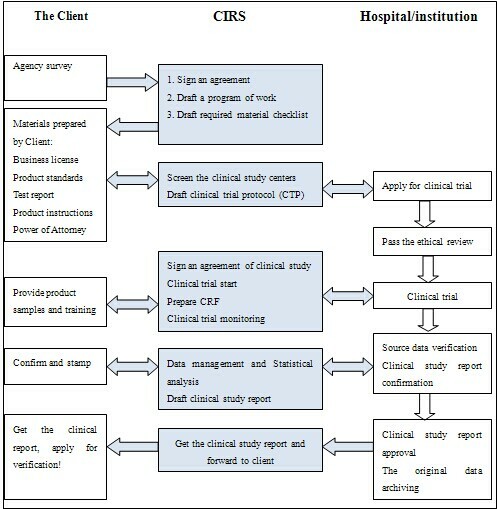 There are three phases to fulfill the clinical study in China: Preparation, Clinical Trail and CSR Preparation, CIRS offers comprehensive clinical trial management services with the following work flowchart. Please join in our “China Medical Device Regulatory Assistant Program” for free proposal. For complex and urgent projects, we will assign a dedicated project manager to customize a program specific to your requirements. We are ready to be of service at any time.